If you would like me to speak at an event, or to arrange a public reading, please email me directly at njones@berkeley.edu. Between Good and Ghetto was the topic of an author-meets-critics session at the 2012 American Sociological Association annual meeting in Denver. Thanks to Write 2 Read Librarian Amy Cheney for inviting me to speak to the girls at the Alameda County Juvenile Justice Center. We talked about some of the main themes in Between Good and Ghetto, and how these themes relate to the girls’ lives. It was a great seminar and I appreciated the opportunity to learn from the girls. It was also very powerful to see some of the girls return to their units with books in hand. Visit Write to Read online to learn more about the program. I visited with Margaret Andersen’s gender seminar and then gave a talk to the department. The faculty and students were great. Thanks for reading the book and the great questions during my talk! 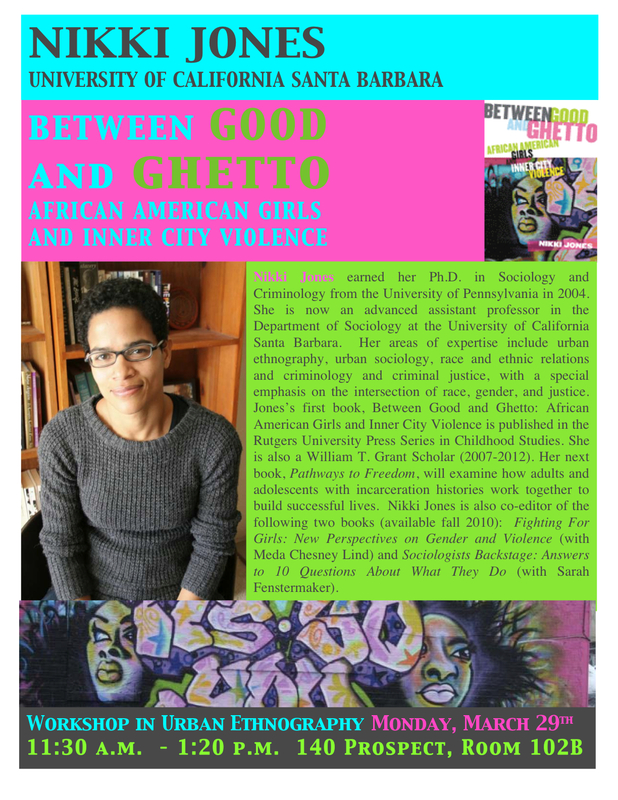 During the talk, I made connections between Between Good and Ghetto, Fighting for Girls, a recently published book I co-edited with Meda Chesney-Lind, and recent statistics from a June CDC report. In BGG I argue that the girls who are evaluated by others as “ghetto chicks” are most likely to receive formal and informal sanctions for their behavior. Institutionally, they are more likely to be suspended and are more likely to enter the juvenile justice system. As I say in the conclusion to BGG, this is the other side of the crisis. A recent report from the Southern Poverty Law Center highlights this point. Since the introduction of zero-tolerance policies in schools, black girls have experienced the greatest rate of increase in suspensions (5.3%). 18% of middle-school black girls are suspended, compared to 4% of white girls. It’s time to pay more attention to the other side of the crisis. I visited with Professor Brooks’ class in the morning and spoke at the Sociology colloquium in the afternoon. Professor Brooks led an important in-class discussion on sexual violence. Very powerful. Great questions from the students. Thanks to those who shared their experiences growing up in neighborhoods similar to the ones I describe in Between Good and Ghetto. Thanks to everyone for buying and reading the book! I visited Professor Mercer Sullivan’s class to talk about Between Good and Ghetto and Fighting for Girls: New Perspectives on Gender and Violence, which will be out in the fall. We had a great conversation about the issues covered in both books. Thanks for the great questions. I am visiting Professor Elijah Anderson’s Workshop in Urban Ethnography on Monday, March 29th. Contact joellen.adae@yale.edu for additional information. I was a guest on KPFK’s “Some Of Us Are Brave”: A Black Woman’s Radio Program hosted by Ronda Dixon. We had an engaging conversation on the topics covered in Between Good and Ghetto, especially girls’ use of violence in school and neighborhood settings. We also discussed the shift to more punitive responses to girls who fight, a topic I explore in greater depth in a new book, co-edited with Meda Chesney-Lind, Fighting For Girls: New Perspectives on Gender and Violence. Click here to listen to the program. Our conversation is featured during the last twenty minutes of the show. I had a great discussion on Between Good and Ghetto with Merry Morash’s graduate seminar at Michigan State University. I answered questions on how I got into this field research, whether or not I kept up with the young women in the study, and what the implications of my research are for policy and prevention. Great group. Thanks for reading the book! I visited Union College, located in the southeastern corner of Kentucky, to give a talk on Between Good and Ghetto and Fighting for Girls: New Perspectives on Gender and Violence, a new book (co-edited with Meda Chesney-Lind) that will be out in the fall. I also sat in on Linda Silber’s undergraduate course. The students read Between Good and Ghetto and I answered questions that students prepared in advance of my visit. Really great questions. I was impressed at how students made connections between the lives of girls in the book and their own lives. A really thoughtful and engaging group. Thanks for reading the book!